Even as BlackRock Inc.’s growth appears unstoppable, there are signs the firm isn’t invincible. The world’s largest money manager saw net flows for its global iShares exchange-traded funds decline 46 percent in the first quarter to $34.6 billion from a year earlier. Even with the fall in flows, BlackRock beat quarterly earnings estimates and saw total assets under management rise to $6.3 trillion. Choppy markets spurred traders to devote less cash to ETFs. And with good reason given that the S&P 500 index ended the quarter down 0.76 percent. 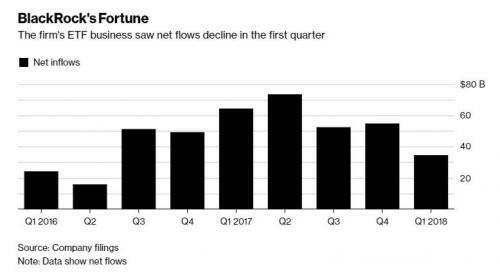 ETFs charging 0.2 percent or less have accounted for 82 percent of the industry’s net flows this year, up from 77 percent in the fourth quarter, according to research from Bloomberg Intelligence. In "data that is alarming that the financial media will likely ignore" news this morning, market volatility has prompted investors to hold off on investing in ETFs at BlackRock, which saw its iShares exchange traded funds fall to $34.6 billion from the year prior. 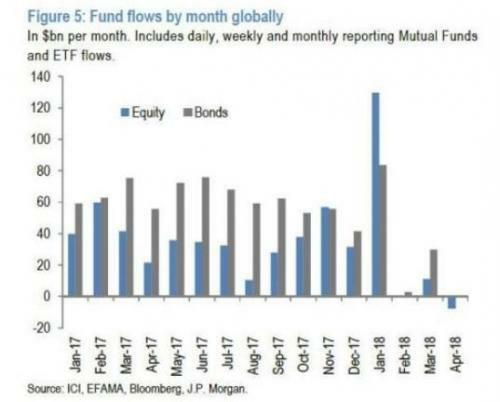 Over the last several months, ETFs have experienced significant volatility in flows as evidenced by the stunning chart below showing how inflows have almost instantly dried up as soon as the market volatility in February started. “Sustaining [ETF] growth at double-digits in terms of asset flows will be really tough to do" for BlackRock, said Kyle Sanders, an analyst at Edward Jones & Co.
Did ETF inflows dry up because of volatility or did volatility occur because money has stopped pouring into ETFs? Could the tail be wagging the dog? ETF inflows are often used as a bullish talking point, not only as a gauge of how healthy and robust the market is, but also as reasoning for why the market almost never seems to go down, especially over the last decade. ETF inflows have constantly been a talking point in the financial media and have been talked about like they are the strong concrete foundation that the market rests upon. “Institutional investors, in particular, reacted to these factors, by de-risking and re-balancing," Fink said in a statement Thursday. "At the same time, we also saw many corporate clients adapting to U.S. tax reform by seeking liquidity to fund future capital investment or more aggressive share repurchases. As a result of these various crosscurrents, BlackRock experienced a significant number of both large inflows and large outflows from institutional clients in the first quarter." As BlackRock’s less expensive ETFs continue to capture most of the money, that could put pressure on revenue. In October 2016, the firm reduced prices on 15 core ETFs aimed at price sensitive retail clients and financial advisers. The money manager is betting that it can offset any fee cuts with greater volume. “I think that is why in the short-term seeing money go to this low-cost stuff might be tough, but it sets them up better for the future," said Bloomberg Intelligence analyst Eric Balchunas. With a good chunk of its in assets sitting in passive, BlackRock is trying to diversify into higher-fee alternative offerings and building out its technology business. The firm is depending on its risk-management system, known as Aladdin, to help with its technology push. Ah, yes - alternative offerings. If not for investment banks scrambling for ways to generate revenue by selling off garbage for a higher fee, we would never have such benign products as CDOs, MBSs and swaps. We'll keep an eye on the media to see if they invite back on air any of the economists and analysts that suggested over the last decade that ETFs will continue to support the market for a fresh updated perspective, given this new data. But we won't hold our breath.